The How to Train Your Dragon series has been delighting audiences since Viking Hiccup first captured, then befriended, his Night Fury dragon Toothless back in 2010. The story of Vikings first fighting, then living with the franchise’s brilliant selection of dragons, proved to be the stuff of childhood dreams. We again visited Hiccup in the film’s sequel that saw Toothless become the dragon Alpha and Berk home to even more lost dragons. Now, How to Train your Dragon: The Hidden World revisits the films characters as they look to the future between dragons and their riders. With Cressida Cowell’s book series beginning with Hiccup as an old man in a dragon-less world, the film fills in this change. The third and finale of the Dragon series is a sweet, heartfelt goodbye to its characters. A year after the events of the second film, Hiccup (Jay Baruchel) is chief of Berk and Toothless is the Alpha and protector of the Islands Dragons. The riders have taken to saving captured Dragons and bringing them back to a now overcrowded Berk. With the rider’s efforts making their Island home a target for trappers, Hiccup and Astrid (America Ferrera) seek to move their tribe to the lost hidden world. A dragon haven where their friends can be safe. But with hunter Grimmel (F. Murray Abraham) aiming to take control of their dragons and the appearance of a female Fury mate for Toothless, can the Vikings and dragons still create their utopia? The Hidden World is once again written and directed by Dean DeBois. Based on the book series of the same name by Cressida Cowell, the film has taken the characters and premise but created its own story. The original voice cast return here with the addition of Abraham as Grimmel and a guest appearance from Gerard Butler as the now deceased Viking Stoick. The film follows a similar narrative to the previous film. It throws the audience straight into the action with a daring dragon rescue. Returning to the Island which is now overcrowded and constantly fighting off trappers. Chief Hiccup suggest leaving their Island and looking for the dragon’s true home to share. We meet the trappers aiming to take the Island who have enlisted the help of Grimmel. The film takes us into danger, changing relationships and the dragon, human flights that the series is famed for; great pace and love of the characters carry you through to the films final battle. The only area where the film falls down, is its villain. Like Dragon 2, the films villain is menacing but lacking in any development or real motive. The series’ best villain remains the giant beast, Red Death from the first film. Once again, the franchise proves to be the strongest animation DreamWorks has produced. Fully rivalling Pixar in terms of visuals and, of course, it’s the flying sequences that stand out. Featuring rides between the boy and his Night Fury, the Berkians and their dragons but now also the Night and Light Fury. The dragons fly through clouds and across an incredible Northern Lights sequence in a feat of animated glory. The dragons themselves are again a brilliant feat in appearance but also their ability to convey emotion without words. The film series has also done once again what few animations have done, it has aged and altered its characters. The change may not be as dramatic as between the first and second film but they have matured in appearance and character. 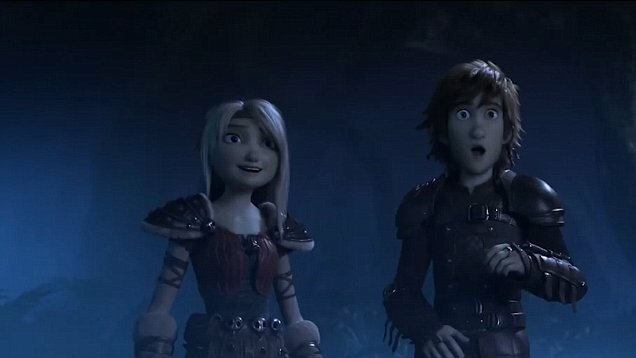 Early reactions to Baruchel as Hiccup may have been against his Canadian accent, in a supposedly Scottish set film, but its now hard to imagine anyone else voicing the boy Viking. Passionate and energetic, his relationships with his father, girlfriend and his dragon are still the films heart. His character has matured but must face his biggest challenge, the potential of living without his best friend. America Ferrera voices warrior Astrid, partner of Hiccup. The second film saw a few missteps with her strong character being used as a plot devise but here she returns as the fearless girl wonder that made her such a joy to watch. The film fails to deliver a worthy villain, but The Hidden World is a beautifully animated, heartfelt goodbye to the characters we know and love. The flying sequences will amaze all but it’s the relationship between Hiccup and Toothless that makes this franchise a firm favourite for it’s loyal fans. How to Train Your Dragon 3: The Hidden World is out 1st February!